January is over and most of us are back into our regular (post/non-holiday) routines. It always takes me a few weeks to get back into the swing of things after the holidays, but when I do it feels oh so good. My personal goals this month have been simple and straight-forward – move more, eat less and cook more at home. Cooking at home comes naturally to me (obviously), but that doesn’t mean I don’t get bored. We all get into cooking ruts from time to time, but the worst time to get into a cooking rut is when you are trying to lose a few pounds and eat right. That’s where today’s giveaway comes in. 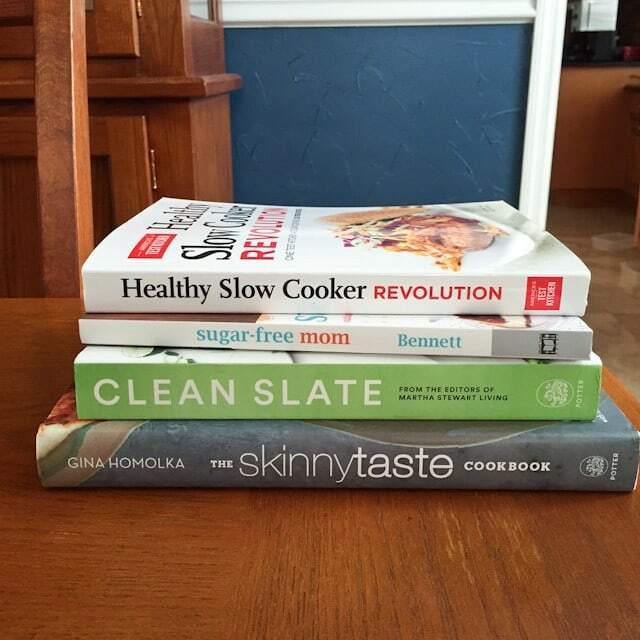 I’m so excited to share with you these 4 healthy cookbooks that I’ve received recently. The authors and publishers of these books have generously given me a copy to review and a copy (of each) to share with one lucky reader as well! Yep, that’s right, someone is going to win 4 new cookbooks! 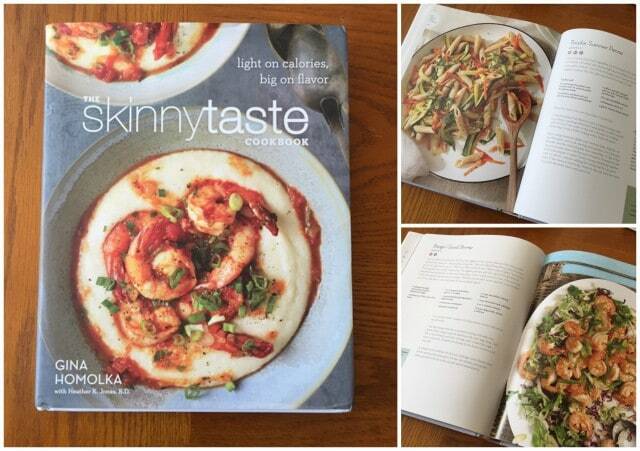 What I Love About This Cookbook: I love quite a few things about The Skinnytaste Cookbook, but first and foremost, I just adore the author, Gina Homolka. I have followed her blog for so many years, originally finding it when I was on Weight Watchers. Her cooking style and philosophy is very similar to mine. We both enjoy healthy-ing up recipes we already love and we stay away from “diet food”. Gina’s recipes are very family friendly which is a big draw for me as well. I could plan a whole week’s worth of recipes straight from this book and I’m very sure that each person in my family will love every single one of them. Another great thing about this book and the recipes is they are made with very accessible, whole and fresh ingredients. This is real food, nothing fancy or intimidating. 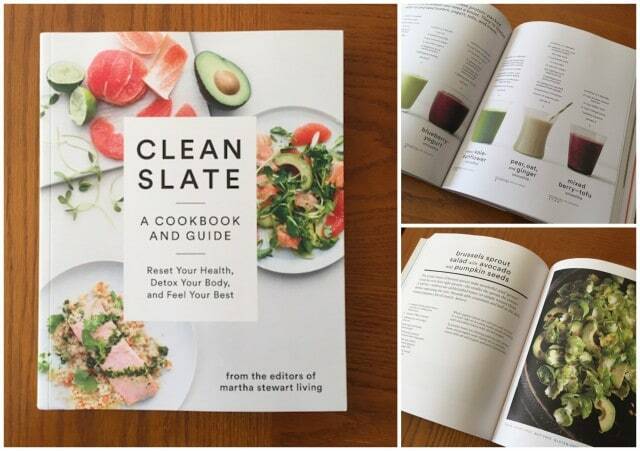 The best part is you will feel good about everything you cook and eat from the book. What I Love About This Cookbook: This book is more than just recipes, it is filled with valuable information on nutrition and taking care of your body from the inside out, most importantly with the food you are consuming. If you are a nutrition junkie like I am then you will love reading through the action focused chapters starting with the Reset chapter which breaks down everything from smart swaps, to explaining which foods are good for detoxifying, inflammation and digestion. This is a very smart book and I find myself learning so much from it. The second part of the book is filled with gorgeous recipes that are nutritious, clean and mostly plant-based (but with some chicken and fish recipes mixed in). I also have to mention there is a section dedicated to detoxifying, anti-inflammatory, energizing and hydrating juices and smoothies. I want to make every single one of them. What I Love About This Cookbook: It is educational! I mentioned being a nutrition junkie before, and this book really educated me on sugar and it’s alternative forms. Brenda really takes the time to give you background on herself, her relationship with sugar, how she stocks her pantry, and how to incorporate sugar free recipes into your cooking and baking. She encourages easing into this healthier lifestyle change and really helps you through the process. Though I personally have no intention of cutting out sugar 100%, it is an ingredient I try to avoid when I can and I am always look for ways to cut back in my cooking and baking. Since Brenda herself is a mom of 3, this cookbook is filled with family friendly recipes. 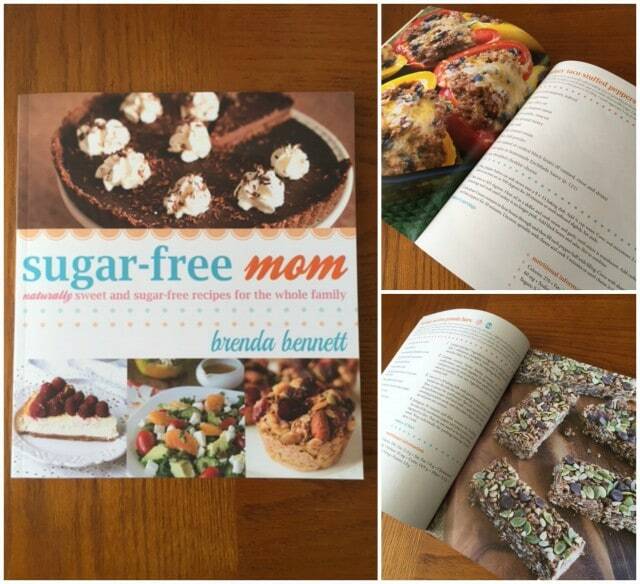 The author Brenda Bennett writes the blog Sugar-FreeMom. What I Love About This Cookbook: What I love about this cookbook is what I love about all of America’s Test Kitchen cookbooks, it’s thoroughly researched and tested cooking methods, tips and recipes. These books truly make me a better cook. There is a whole chapter dedicated to Slow Cooker 101 that explains in depth how to cook with a slow cooker, more specifically how to cook healthy in a slow cooker. It also features a section reviewing 9 different slow cookers. Giveaway starts Sunday, February 1. Winner will be chosen through Rafflecopter/Random.org. Winner will be contacted by me via email and will have 48 hours to reply before another winner will be selected. Sorry, but giveaway open to US addresses only. We have autoimmune disease in my family – arthritis and psoriasis – so I’ve been experimenting with an anti-inflammatory diet. I’ve found cutting back on sugar really helps my inflammation, and I’ve definitely reduced my taste for it. To pray more…. and to keep up with my exercise. One healthy goal I set for myself is to cook more. For awhile I’ve been eating out a lot and feeling terrible from it. I know that when I cook I always feel better, because I use whole foods that nourish my body. I want to continue to avoid processed foods and shop/cook more locally grown foods. My husband and I have set a goal to lose weight and eat healthier. We started on our quest the Monday of Thanksgiving week with the mindset that if we could make it through the holidays then we could make it through the new year. At this point I have lost 30 pounds and he has lost 22 pounds. We are loving learning new foods and ways to cook them. My healthy goal is to eat more mindfully. I’ve been keeping track of what I eat, cutting back on unhealthy fats, sugars, and processed foods, and replacing them with more whole grains and fresh fruits & vegetables. To get back into my workout schedule. I just finished my Whole30 and am continuing on a very healthy eating journey. I love food and cookbooks and have been a big fan of Skinnytaste for a while. These cookbooks look amazing! I love healthy, flavorful recipes that my teen girls will eat and love! I’ve tried several from Aggie’s Kitchen, and we are big fans! Plus I bring leftovers to work for lunch, and everyone always wants the recipes!! To eat more veggies and fruit. To use less fatty foods and more vegetables. Also less meat. I love these cookbooks and I too am a collector of cookbooks. A nice giveaway and I hope I win. I love cookbooks. I get so bored and must try new things often. My husband is trying to lose weight so good but healthy meals are what I am looking for. I am trying to watch my sugar intake and eat more fresh foods! I, too am trying to keep it simple by moving more and eating less…especially less of the sweets! To continue juicing as a priority and whole food at home. To encourage my youngest child to eat more veggies is our goal! Our big goal is more greens! We both, hubby and I, know that we need more of these nutrition power houses in our diet and have resolved to make it so. Maintain a healthy weight and push myself to try new things in the kitchen! 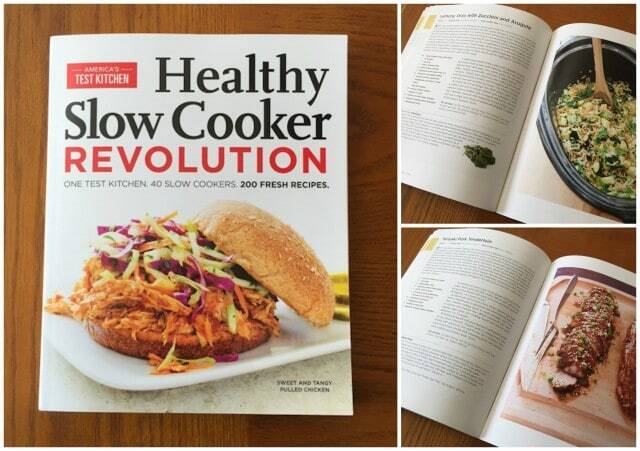 The Slow Cooker Cookbook looks phenomenal! I am in constant search of healthy and tasteful recipes for my family. We each have particular eating habits and interests and combining everyone’s likes/dislikes/ and needs can be challenging:) it’s a lot of trial and errors in my kitchen! Trying to eat meals on a smaler plate and walking more. I’m trying to cut back on sugar. I am working on adding more vegetables to my diet and walking every day. I’m watching my sugar consumption. This year I am trying to eat healthier and lose weight! My goal is to lose enough weight that I no longer gasp for air coming up my front steps! I’m 60% away from my target weight, my goal is to continue on this journey and to complete a 1/2 marathon in September. One healthy goal I have set for myself this year is to exercise at least 3 days per week. Thanks for this giveaway, I would LOVE to win!! I’m committed to doing Jillian Michael’s 30 day shred! Pray for me! Ha ha! My healthy goal is to incorporate more raw fruits and veggies into my diet! My healthy goal is to eat more vegetables and less sugar. I’m in a rut. Making the same things. These would help jump start me and sound informative too. Thanks for all the recipes you post. They’re so doable without having to buy a million weird condiments or spices. One healthy goal I’ve recently set for myself is to seriously cut back on sugar! i want to eat more vegetables. Cooking more at home and making my lunches!!! Those will ALWAYS be healthier than eating out at work! I need to exercise more and try to cook more meals at home! drink more water and get more sleep! I want to continue to not eat curbs too often and not eat processed food. I’m really trying to be less sedentary. One goal I have made for myself is to drink more water. I don’t drink enough water so I made this goal for myself for this year. This year I’d like to simply eat less. i am trying to eat less sugar, more salads! I’m trying to up my water intake. I don’t drink nearly enough. While I do a decent job of keeping things healthy, I want to focus more on really getting the nutrients I need and would love some inspiration! I’m working on eating more vegetables. My husband and I are trying to cut back on eating out. It’s actually been fun to try to cook new foods and avoid the stress of being at a restaurant with two kids. Didn’t see it’s supposed to be a goal…..to be more diverse in my meal plans….get out of this rut! I reached one year smoke free, have stared swimming 3 to 5 time a week have made eating for health . Love creating healthy recipes and just since August lost 14 pounds and lowered cholesterol. would love to win any of the cookbooks. I always have so many good intentions but I’m not very good with follow through. I always have something that interferes. Sometimes it’s of my own doing. I’m used to be a very healthy eater. I always drink lots of water. I definitely am going to be focusing on doing a better job at portion control and another healthy priority this year is to increase my activity level. To lose these last stubborn twenty pounds. My healthy goal for this year is to drink more water. We have been trying to eat better, byeating more fruits and vegetables. We are adding exercise to our daily routine. Thanks for the giveaway. I love fruits and veggies, but I tend to “forget” to eat them, so I’m going to try to include them at every meal. Thank you so much for the awesome review Aggie!! I’m discovering that I am allergic to dairy, so I’m committed to learning to eat dairy free—a challenge for one who eats yogurt all the time! These cookbooks look fantastic, and I can’t wait to read them. Thanks for your insightful reviews! To get back into working out and eating healthy. These books look amazing! I’ve just rebooted my families eating, and these will be a great resource. I recently had gout and have been advised to follow a diet without sugar or artificial sweeteners and cut out processed foods. Pretty good advice for most of us really! I plan on doing more walking. I don’t need to lose weight as much as I need to tighten and re-arrange what I already have. I am cutting back on sweets and carbs in order to improve my health and drop a few pounds. I’ve borrowed The Skinnytaste cookbook from the library and absolutely love it. Have tried some recipes and can’t wait to try more. Thanks for the opportunity to own these books! My goal is to move more and eat healthier. Would love to learn how to make healthy flavorful meals. I am really trying to add more fruits and vegetables to my day!! Always trying to improve our diets and looking for healthier eating recipes. I just finished cooking brown rice and looking forward to trying the Salmon Spinach Bake today. Sounds so yummy!! I am trying to eat healthier lunches – instead of my usual leftover pasta. Today i had a yogurt with granola! I’ve resumed my regular runs now that I’m working from my home office again. I wake up and put on my running clothes and make myself jump on the treadmill before lunch. I’m also eating far lighter lunches now that I’m making my own choices instead of eating out with my husband (we work together). I hold my husband completely responsible for the weight I need to lose right now 🙂 I love all of these books!!! I would love the sugar free mom cookbook, I need to work on cutting back the sugar…I love to bake so it’s a given I use a lot of sugar! processed foods are my nemesis. They are just way too convenient. I am making the transition to low sugar real food. To eat more healthier and grow more veggies myself! My healthy goal this year is to eat more veggies and to move more! I would really like to cut the carbs and use only whole grains in small proportions. to drink more water, less coffee! We need to get back on the healthy track! Exercise is not enough. I would love to incorporate more whole ingredients with minimal sauce mixes and still achieve great family friendly flavor! To eat more leafy greens and fiber.